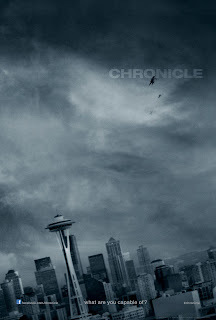 Up until an email popped into my inbox with the trailer for Chronicle attached, I was blissfully unaware of its existence. Now, however, I am extremely excited to see it. It will interesting to see how they approach the subject matter wherein the main characters spiral into madness all the while in possession of super powers. Power corrupts. Absolute power corrupts absolutely. "New technologies and social communities allow us to record, post and comment on every second of our lives, sharing our every emotion and opinion with the world, no matter how mundane. For three high school classmates who suddenly gain superpowers from a mysterious substance, the chronicle of their ordinary lives is about to take on extraordinary turn. Initially they use their powers to play innocent pranks on each other and people around them, but soon they gain confidence and learn to control their powers better to take on more difficult tasks. Their newfound sense of immortality and impunity will force them to evaluate their own morality to ultimately decide where to draw the line about how far they should go."